It wasn't the best of starts for the Sherwood High School football team. 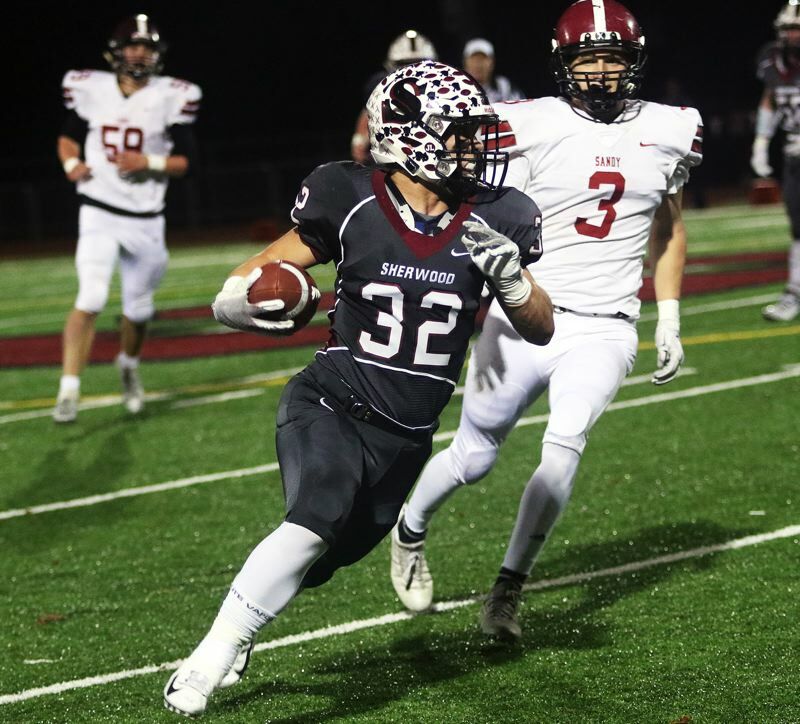 Already facing a tough task, the Bowmen spotted a talented, and third-seeded Sheldon squad a quick 21-0 lead in the teams' postseason contest. While other teams may have possibly thrown in the towel when faced with such an obstacle. But the Sherwood took on the challenge, and the deficit, head on. The Bowmen closed the Irish lead to 34-28 in the third quarter, before falling 44-28 in the Class 6A state playoff second-round game played Friday at Sheldon High School in Eugene. "The kids could have folded the tent," Sherwood coach Greg Lawrence said. "But our kids battled. We had the fans going, and our kids were excited, but we just couldn't finish it." With the win, Sheldon, the Southwest Conference champion, and the No. 3 team in the final OSAA power rankings, improved to 9-2 on the season. The Irish also advance to the quarterfinal round of the Class 6A state playoffs, where they'll host West Linn on Friday in a game starting at 7 p.m.
Sherwood, the No. 2 team out of the Pacific Conference, and the No. 14 in the power rankings, finished its season with a final record of 5-6. Five of the Bowmen's six losses came against teams (Sheldon, West Linn, Clackamas, Liberty and Central Catholic) that are still alive in the quarterfinal round of the state playoffs. "I'd call it a successful season," Lawrence said. "I think the kids learned how to handle adversity." Speaking of adversity, Sherwood had to deal with some early on during Friday's playoff game at Sheldon. The Bowmen tried an onside kick on the opening kickoff, but Sheldon recovered the ball, giving the Irish good field position. Sheldon took advantage of that, getting an 8-yard touchdown run by senior quarterback Michael Johnson Jr., giving the Irish a quick 7-0 lead. Sherwood, in its ensuing possession, went three-and-out, and the Bowmen then had a punt blocked. That helped set up a 20-yard touchdown pass from Johnson to senior tight end Patrick Herbert. Sheldon followed that up with a 30-yard TD pass from Johnson to senior receiver Jack Folsom, giving the Irish a 21-0 lead less than nine minutes into the contest. "Right then, I was thinking, 'oh boy, this isn't good,'" Lawrence said. But the Bowmen battled back in the second quarter. They got on the scoreboard with a 1-yard touchdown run by Ian Stormont. Then, after Johnson scored on a 3-yard run, Sherwood senior Ryan Scroggin scored from two yards away, trimming the Sheldon lead to 28-14 at halftime. The Irish opened the scoring in the second half with a 12-yard touchdown run by senior Matthew Burgess. Sherwood blocked the extra point try, leaving Sheldon with a 34-14 lead early in the third quarter. But, again, the Bowmen came battling back. Sophomore Jack Causey scored on a 9-yard run and, just a couple minutes later, Scroggin scored on a 39-yard run, trimming the Sheldon lead to 34-28. "Things were going well," Lawrence said. "We got back within six." Sheldon got a 36-yard field goal by sophomore Jay Kartub later in the period, giving the home team a 37-28 lead going into the fourth quarter. "Things got ugly after that," Lawrence said. Sherwood fumbled the ball away three times, and Sheldon added another touchdown run by Burgess, making the final score 44-28. "We had a shot," Lawrence said. "We came up short, but the kids battled, and I was proud of them." For the Bowmen, Stormont ran for 121 yards on 18 carries. Scroggin added 90 yards on 10 carries. Senior quarterback Cade Chidester completed four of seven pass attempts for 77 yards. Senior Jacob Reuter had two catches for 53 yards. For the Sherwood defense, senior Ben Baxter had an interception, Reuter had a fumble recovery and senior Carter Atkins had a quarterback sack. "After a 1-4 start to the season, we just kept getting better and better," Lawrence said. "The kids worked hard every single practice." For Sheldon, Johnson completed seven of 10 passes for 102 yards, while also rushing for 90 yards on 19 carries before suffering a knee injury in the third quarter. Burgess ran for 168 yards on 20 carries.